Promethean’s Conventional Milk Chiller is a modular milk chilling system that can cool from 35o to 4o C without a diesel generator. The capacity of the system ranges from 500 Litres/Day to 2000 Litres/Day. It works even if there is no power during the milk collection by using only 4 hours of intermittent grid power between each milking shift. The Conventional Milk Chiller is a solution for customers who are sensitive to the chilling costs and would like to reduce their operational expenses by replacing the high cost diesel with lower cost thermal energy. By eliminating DG set, Promethean Milk Chiller provides the most cost-effective way of collecting top quality chilled milk from village milk collection centers where grid power is erratic. Premium quality enables longer shelf life of processed milk and higher margins on value-added products. Capture more farmers in the catchment area. Eliminates spoilage of raw milk. Low maintenance & operating costs. Unlike electrical batteries, thermal battery does not need to be replaced every 3 years. 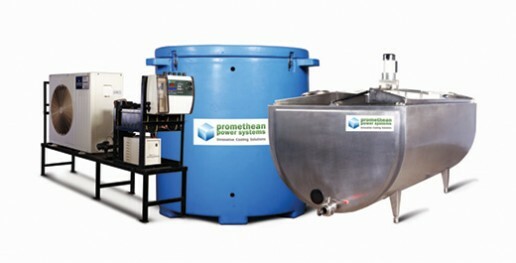 Temperature drop is much sharper with Promethean’s CMC due to the usage of stored thermal energy.